As the season reaches the business end of proceedings and Notts continue to climb up the table, Ben looks back at the best players he's faced this year and nominates the best goal he's ever scored. "We’re slowly climbing the league table and starting to catch up on some of our games in hand, in the process closing the gap on table-toppers Rochdale. They have been extremely consistent this year and have a fantastic home record. We have played against some very good players this year but for me Rochdale’s striker Chris Dagnall has been the pick of the bunch." Another week has gone by and we've played two more games as we continue to battle through our hectic schedule of League Two fixtures. We have chalked up two wins against Accrington Stanley and Chesterfield in the last week and are currently sitting Fourth in the League. We put on a good show at Accrington in difficult conditions, on a very sandy pitch where I managed to score the first with a headed goal as we won three nil. 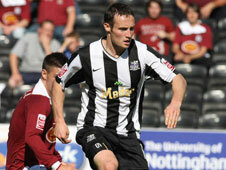 We then entertained Chesterfield Town at Meadow Lane in a very hard-fought local derby. The atmosphere was brilliant and we won the game one nil. I scored the only goal which took my goal tally to eleven for the season. It was one of my best goals of this campaign and it was even more enjoyable for me as it won us the match and gave us the points for our fourth win in a row and our fourth clean sheet in as many games. We're slowly climbing the league table and starting to catch up on some of our games in hand, in the process closing the gap on table-toppers Rochdale. They have been extremely consistent this year and have a fantastic home record. We have played against some very good players this year but for me Rochdale's striker Chris Dagnall has been the pick of the bunch. He was very lively against Notts when we played them and caused us problems all night long. He's a very tricky player with good pace and knows where the net is as he has proved time and time again this year. There were strong rumours linking him with a move away from Spotland in January but it has definitely been to Rochdale's advantage that they kept hold of him instead of cashing in on their star asset. Another player who really caught my eye when we played them was Rotherham United's keeper Andy Warrington. Andy is very experienced and has been around for years. He is one of the best keepers in the League and was unbeatable when we played against them. He performs week-in-week-out and I have voted for him in my P.F.A League Two team of the year as the best keeper in the division. As I play on the wing I have come in contact with some very good full backs this year. The best I have come up against this season would be Port Vale's Kris Taylor. His positioning as a full back is very good and he has got a great left foot. He also contributes with a goal now and then as well and is comfortable with the ball at his feet which is something you can't say about every defender in this division. As my goal the other night was one of the better ones in my career, it got me talking with our masseur, Paul Evans "Evo", in the physio room after the game. Evo is the ex Brentford United and Wales midfielder who also played for Bradford, Shrewsbury Town, Swindon and Nottingham Forest and a player who was renowned for a spectacular goal. He most famously scored a goal from inside his own half straight from the kick-off and has his own little video collection of all his goals on the Internet. There are a few crackers out there of which this is my favourite. Although I enjoyed my goal the other night my favourite goal came about four years ago at The Molineux against Wolverhampton Wanderers. It was a free kick from about thirty five yards that flew in to the top corner. What made it even better was that a few of my friends are Wolves fans and were sitting in the Wolves stand right behind the goal where it went in. I still remind them of it every time I see them. Then there's this goal. I didn't actually score it as such but i'm still claiming it. You'll see what I mean when you see it! We are now approaching the best part of the season. Every game starts to become vital and every point is crucial. I am intrigued by the race for the Premier League title this year as well as our own. I cannot remember a season where the top teams are dropping so many points. It's a three horse race and I do feel it could go right to the wire. I would like to see Manchester United win it but I feel this year Chelsea are going to do it. The clash between United and Chelsea at Old Trafford towards the end of the season could really go a long way to deciding who wins the trophy. You still can't rule out Arsenal though. They have clawed their way back in to the race and are hitting form at just the right time. My bet for this week is Chelsea to lift the Premier League Title this year at [2.72]. Sorry there are no tips today - Please come back later. Choose and earn a $50, $250, $500, $1000 or $2500 poker sign up bonus. Turn Loyalty Into Cash and earn up to 40% Valueback in the Players Club. 100% deposit bonus up to £100 for all new casino players. Just join and play to claim.